Watercolor painting seems easy (if you can at least paint or draw, that is) and I've always wished I could produce something worthy of mounting on a wall. Alas, not. This interesting handbook has an informative introduction and history of watercolor paint which, although brief, is worth knowing about. Many people are naturals when it comes to drawing or painting, while others, like me, need all the help they can get. I used to find "painting" very therapeutic, especially when I wasn't feeling up to par. The act of using a brush dipped in paint and swiping it across a piece of paper had a calming effect on me - I didn't produce anything worthwhile but the object of the exercise was to feel better, not to paint a picture. We are given a small selection of colors to begin with which is helpful in keeping inital costs down. It's easy to go overboard when starting out as there are some truly wonderful colors out there. They say that even professional painters don't usually have more than a dozen colors. Other colors can be obtained by mixing certain colors together (see charts pages 122 - 132). There are also guidelines to brushes and paper which are good to know. You are taken through washed, wet-on-wet, backruns, glazing, stippling, scumbling, and more. Sponge painting is also covered which is quite dramatic. Focal Points, Perspective, and Composition are also discussed. Wonderful examples (which you can try and emulate) are abundant throughout the book. 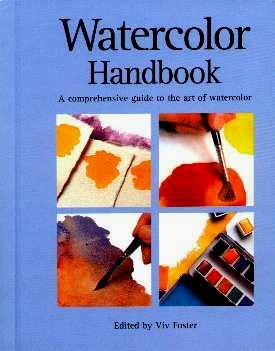 Watercolor Handbook may be purchased and/or ordered through your local bookstore. Conclusion - Very interesting and informative and would make a great gift to the artist in your life.